Inspired by the success and enthusiasm of the Screening the Future conference in 2011, PrestoCentre presents Screening the Future 2012: Play, Pause and Press Forward. This year’s conference is organized by the PrestoCentre Foundation in collaboration with the University of Southern California, Shoah Foundation Institute and Digital Repository. 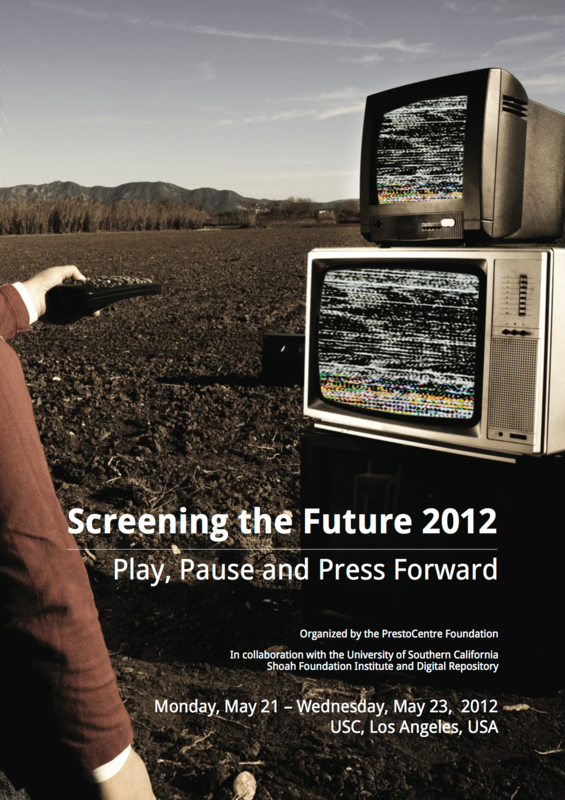 Screening the Future serves the global community of stakeholders who keep audiovisual content alive. This annual international conference brings together archivists, small and large archives, production companies, film makers, TV producers, service providers, vendors, funders, policymakers, and educators who are developing solutions to answer the most urgent questions facing audiovisual archives. With Play, Pause and Press Forward as the theme of this year’s conference, we explore the current status of audiovisual archives; the main challenges that archives and producers face in terms of IT, institutional position, and changes in use and market; and their future readiness. Archiving in production – the position of archives in the rapidly changing AV production climate. Managing the cost of archiving – budgeting, forever cost and endowment pricing. Infrastructure, repositories and services – the options and limits of archival systems in a variety of institutions. Archiving future data – the attributes and requirements of future generated AV data. Trusting the future archive – trusted auditing and certification of audiovisual archives and repositories. The conference takes place from May 21-23, 2012 at the University of Southern California Ronald Tutor Campus Center, Los Angeles, USA. Discounted conference rate is available for PrestoCentre members.